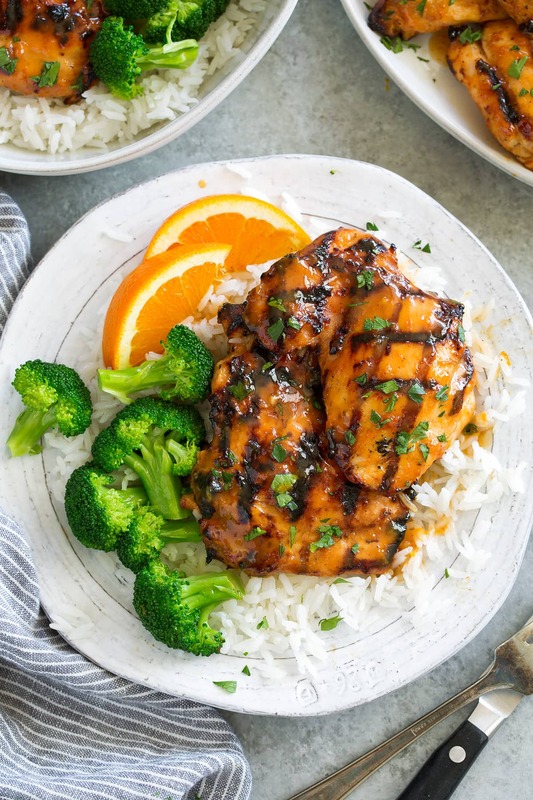 Sticky Honey Orange Grilled Chicken has such a bright and delicious blend of sweet, tangy and smokey flavors. Its so easy to make and that glaze will leave everyone craving more! My whole family loved this chicken! 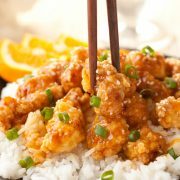 We are all used to the battered and deep fried, bite size pieces of Asian Orange Chicken but I wanted a grill friendly orange chicken with some unique and exciting flavors and that’s just what you get here. It may seem like an odd blend of ingredients but it just works. And the Mexican hot sauce is just what I had on hand but use what you like. I did also try this with sriracha and I preferred something less sweet and more tangy, something that was maybe a little less bold. 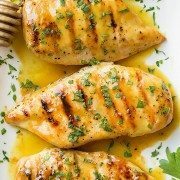 Breasts will work too for this recipe, just pound them to an even thickness with the flat side of a meat mallet and adjust grill time if needed (for example, 8 oz breasts may only take 4 minutes per side total, to brush with glaze at about 3 minutes). 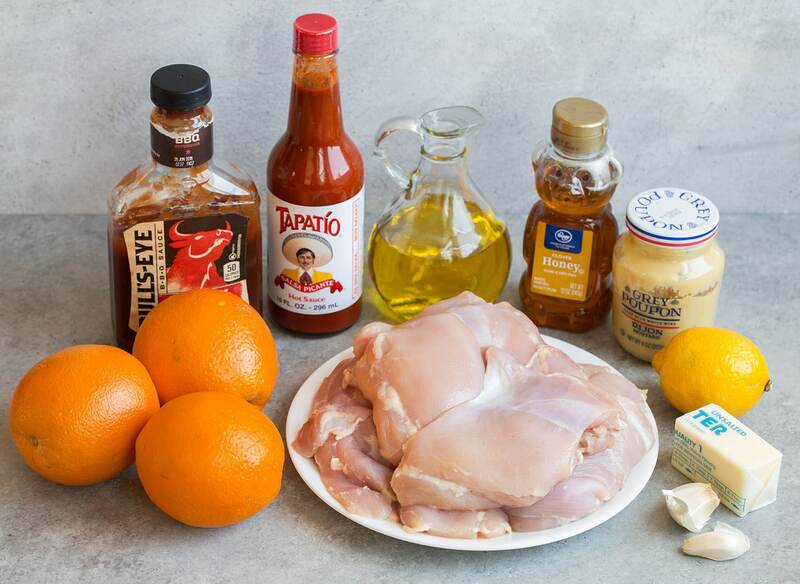 First you’ll start by mixing together all of the marinated ingredients, the orange juice and zest, lemon juice, olive oil, hot sauce, dijon mustard and garlic. 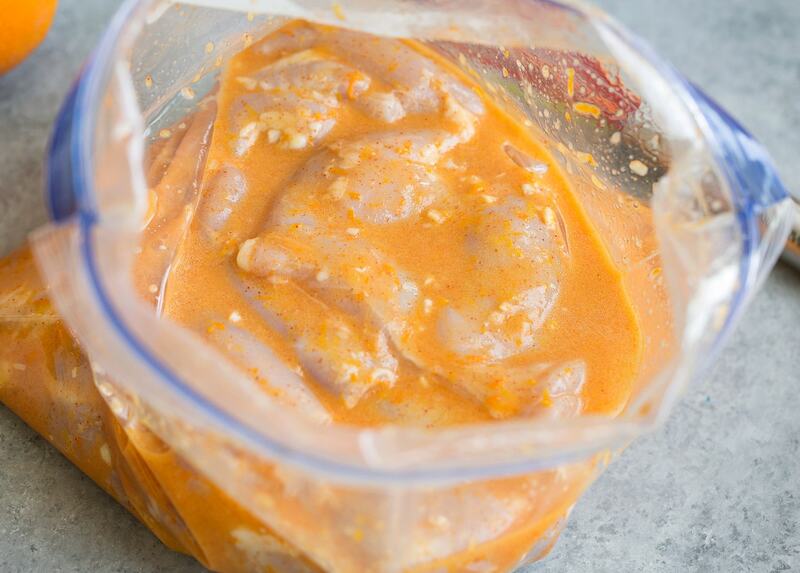 Place the trimmed chicken thighs in a gallon size resealable bag then pour marinade over. Seal bag while pressing out excess air then let marinate for at least 1 hour and up to 6 hours. After marinating preheat grill over medium-high heat. While grill is preheating prepare the glaze. 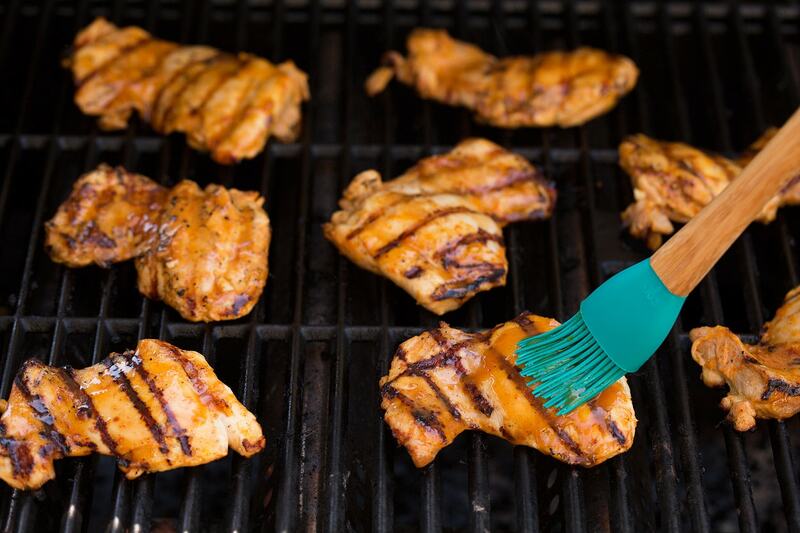 In a small sauce pan melt the butter, whisk in orange juice, orange zest, honey, BBQ sauce, and dijon mustard. Set aside about 1/3 cup of glaze for serving. 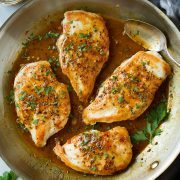 I’m already planning out the next time I’ll be making this chicken because it was just that good! At first I questioned this combination of ingredients but it just works. And I loved how I could really taste the fresh orange flavors in the chicken. It wasn’t like using orange marmalade. 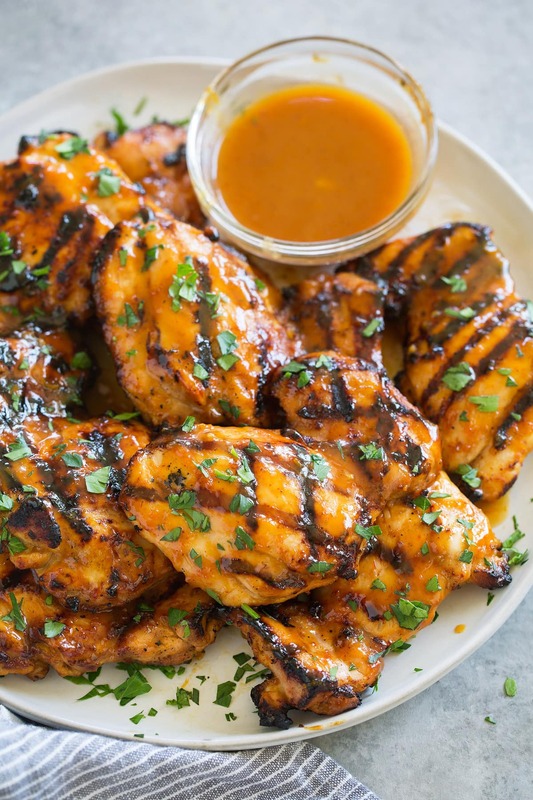 Here you get fresh zest and fresh squeezed orange juice in marinade and the glaze so everyone will taste that bright and satisfying orange goodness. Don’t miss out on this recipe, it’s just too tasty to pass up! Kathy Bruyere: Are these bone – in thighs? Kathy Bruyere: Thank you !